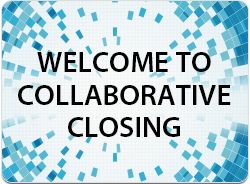 We're Building a Collaborative Closing Solution! Our Collaborative Closing Solution is a seamless 2-Way data exchange between lenders and settlement providers! DocMagic brings lenders, settlement providers and associates together inside our new Collaborative Closing Platform to view and exchange data, coordinate closing costs and audit critical disclosure details prior to closing. DocMagic’s Collaborative Closing Platform is a secure, seamless and dynamic web-based solution designed to efficiently help you meet TILA-RESPA Integrated Disclosure requirements.